Social Studies teacher Matt Wiemer is the recipient of this year's David L. Zemsky Teacher of the Year Award. Social Studies teacher Matthew Wiemer has been announced as the winner of this year’s David L. Zemsky Teacher of the Year award. Wiemer, who teaches both AP U.S. History and American Studies, has worked at Niles West, where he also student taught, for 14 years. The Zemsky award, named after Niles West alumnus David L. Zemsky, who attended the school between 1980 and 1984, is awarded to one teacher each year based on student selection. The award will be formally presented to Wiemer at the Accolades Ceremony on Thurs., May 17. As for his feelings about receiving the award this year, Wiemer said he was pleasantly surprised. His favorite components of working at Niles West are his experiences with his students. Weimer’s students love the energy he brings to the classroom on a daily basis. Even Wiemer’s former students can recall his entertaining classroom environment and superior teaching abilities. “Mr. 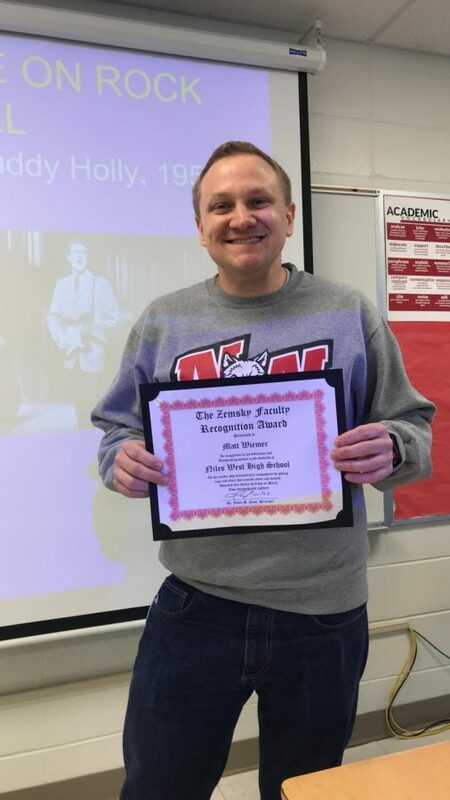 Wiemer didn’t just ensure my understanding of the facts of APUSH and my total preparedness for the AP test in the spring, his engaging teaching methods and charming personality made me excited to come to class every day,” senior Nate Glancy said. “He did more than make the information accessible; he made it ridiculously enjoyable. Mr. Wiemer is a model teacher, and I’m genuinely proud to know he has received this award that he’s always deserved.